Hello and welcome to my site. 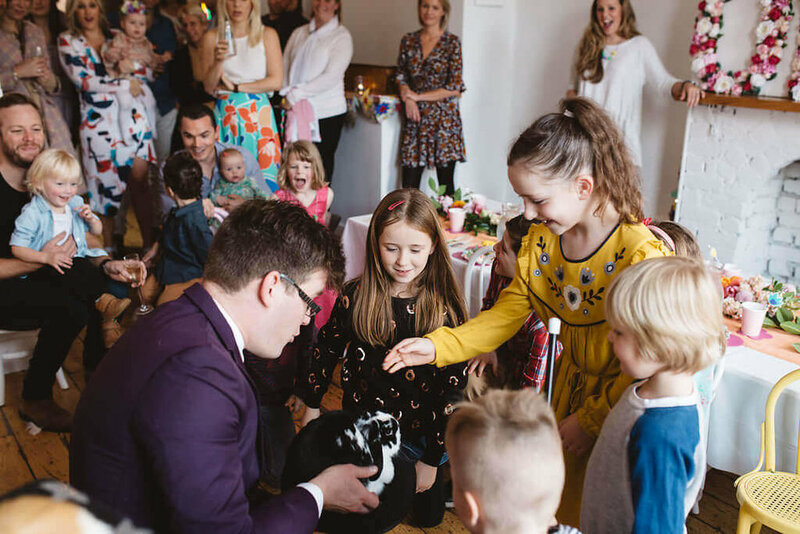 I perform a comedy magic show with lots of animals. Here you can find photos, testimonials and a description of my show. Please call me on 0403 760 764 to have a chat about the type of show that would suit your party best. - Amazing Ashley. The amazing birthday child is the star of the show. For the first trick the birthday child makes a beautiful dove appear from a handkerchief; the first of many animals that he or she will make appear, disappear and transform. At the end of the show the birthday child will surprise all of their friends by turning one of the doves into a fluffy white hen. Your child will feel like an amazing magician, performing incredible and memorable magic tricks for their friends and family. I perform for all age groups, with routines suitable for any family function. There is lots of audience interaction so all the children become part of the show. At the end the children can pat the rabbits and hold the doves, and I can make balloon animals for them to take home. While my routines are designed with the sole aim of making children gasp with amazement and roll around on the floor with laughter, the parents will also enjoy my show. Parents and grandparents often tell me that the tricks amazed them as much as the children. And it is so much fun watching the children enjoy themselves! Take a look at some of the photos or thank you letters parents have sent me.